... With 30mm of tubeless tyre underneath grip was never an issue, nor was there any trace of flex or inefficiency anywhere betwixt road and pedals/bar. Put bluntly, this is one of the snappiest bikes off the line I've ever ridden. Stomp>GO! Flat-out fast: This is the first flat-bar bike I've reviewed through the prism of someone addicted to going fast in an aero position on drops. I must confess I thought I'd be concluding it would be nice for a nippy commute or for those with chronic back issues. After the first hour I realised I was being schooled in how not to underestimate based on cockpit arrangement – if you pull up to the lights or the start of a descent alongside a Paradox, more fool you if you think it's going to be an easy win. Fundamentally it rides like what it is – a high-end titanium frame designed to offer relief from harsh road surfaces with its ample seatpost ..., yet is stiff where it counts around the bottom bracket and chainstays to give the feeling of effortless acceleration. 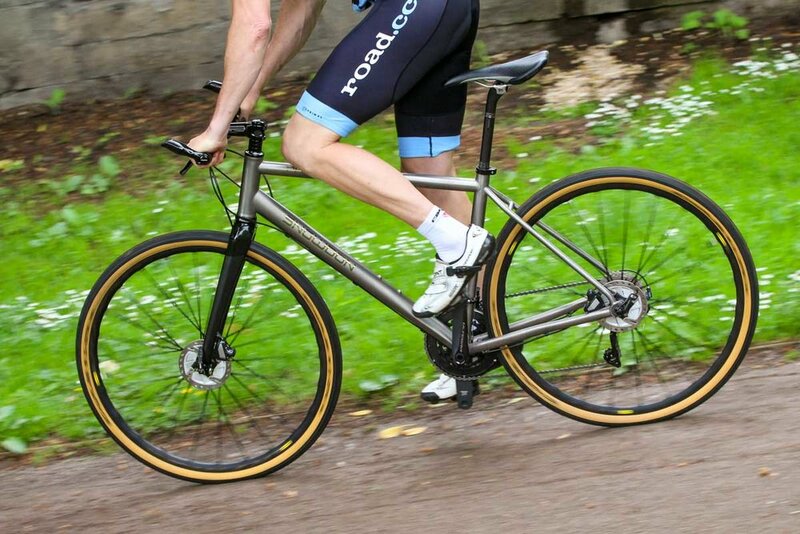 Paradox 38 is billed as a flat-bar gravel bike and it performs beautifully when you head off smooth asphalt and on to loose and uneven surfaces…. Even long-time drop bar users are likely to find control in technical situations a little better with a flat bar. The extra width helps keep things steady, manoeuvrability is a touch simpler and the brakes and gears are just a smidge easier to operate, particularly when you're riding out of the saddle – at least, that's what I've found with the Paradox…. Head onto pox-marked gravel roads and the Paradox easily maintains its line so you don't find yourself constantly battling to keep it straight. You also get lots of comfort here…. The Paradox 38 has been more than capable of withstanding all the abuse that I've chucked its way…. The Paradox 38 is similar in that it jumps into life when you ask for some speed. If you associate a flat bar with a sedate performance, think again. This is a bike that'll handle all the power you can muster and it's burly enough to cope with a battering over any knackered old tracks you fancy exploring…. The sloping top tube means that you'll almost certainly have a lot of the slim (27.2mm diameter) seatpost extending out of the frame …. The rougher the road, the more you'll appreciate that…. I find a flat bar easier for stop-start riding and manoeuvring at relatively slow speeds…. Red the whole review here. A truly impressive and original bike... Some of the neatest tig welds we have ever seen. Why the compact frame? It’s all down to comfort, which is heightened by the extra-long seatpost that flexes slightly to cope with urban bumps.